What is a buyer persona guide? This is world’s most comprehensive buyer persona guide ever created. This guide would help you to create, test, modify, retest buyer persona and reiterate the whole process, again and again, to get amazing results in your business ultimately transform your business. This guide divided in following eight sections. Each section has subsection. Whether you are a business owner, entrepreneur, sales manager, marketing manager or associated with a digital marketing agency, in fact, anyone who needs to get clarity regarding who are their customer, who should be their customers and how to get new such customers. This guide is applicable to small, medium and large size businesses as well as non-profit organizations. How can we use this guide? 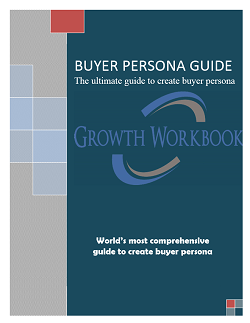 There are free buyer persona guides available. Why should I buy this? The best part of all is this buyer persona guide going to be updated frequently. That means we are constantly researching and updating so you can keep getting the best and the latest in the market. So you can focus on what you can do the best which is delivering huge value to your company or to your client.